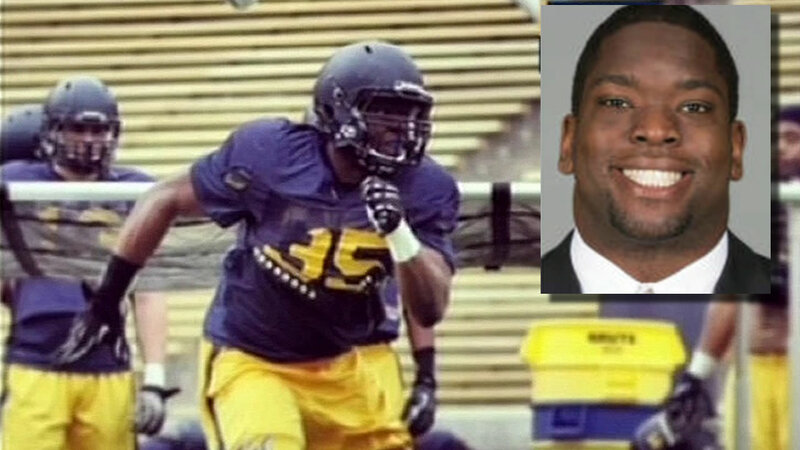 BERKELEY, Calif. -- The parents of former University of California at Berkeley football player Ted Agu, who died after a training drill in 2014, have reached a $4.75 million settlement with the university, UC officials and the attorneys in the case said on Thursday. Agu, 21, a defensive lineman from Bakersfield who was a junior majoring in public health, collapsed and died during a conditioning workout near Cal's Memorial Stadium shortly after 6 a.m. on Feb. 7, 2014. Agu's parents later filed a wrongful death complaint in Alameda County Superior Court alleging that the university and the football team's trainers shouldn't have placed him in such a strenuous workout because he carried sickle cell trait, a blood abnormality that experts believe can lead to death under extreme exertion. UC Berkeley officials said that as part of the settlement, the university will continue implementing changes to further protect its student-athletes, including those who have sickle cell trait. In addition, the university has agreed to maintain a memorial of Ted Agu in the football team's locker room. Steve Yerrid, one of the attorneys for Agu's parents, said the memorial is important so that "no one forgets what happened to Ted Agu and people remember that his death was unnecessary and take steps to prevent another similar death." "The university is glad to have reached a resolution with the Agu family, as it has been a difficult process for everyone involved," university spokesman Dan Mogulof said in a statement. "Now UC Berkeley can continue to focus its energies on enhancing the safety and well-being of student-athletes," Mogulof said. Mogulof said that since Agu's death, Cal has strengthened its safety protocols for student-athletes by enhancing training for coaches and conditioning staff, instituting new student-athlete medical screening protocols and requiring additional oversight of workout plans, among other measures. The settlement came about three months after the university admitted liability for Agu's death. Yerrid said the university initially litigated the case very hard, "but when all the evidence came out, they finally accepted responsibility and agreed to implement reforms." Yerrid contrasted UC Berkeley's attitude toward that of the University of Central Florida, which he said is still seeking to avoid responsibility for the 2008 death of student Ereck Plancher, who also had sickle cell trait. Brian Panish, another attorney for Agu's parents, said in a statement, "This is an excellent outcome, allowing the Agu family to avoid reliving their pain in a trial. The outcome also acknowledges that Ted's incredible life and spirit has and will continue to make a difference." Cal football coach Sonny Dykes said shortly after Agu died that he had come to the university as a walk-on but earned a football scholarship "because of his hard work and determination and the kind of teammate he was." Stefano Bertozzi, dean of the UC Berkeley School of Public Health, said Agu was "a strong student with plans for medical school."